For full background, make sure to read this recent feature on the first landing on Fiery Cross Island and China’s strategy concerning its man-made islands by clicking here. “The successful test flight proved that the airport has the capacity to ensure the safe operation of civil aviation large aircraft, will transport between reefs supplies, personnel, medical aid provided convenient mode of transportation, while the South China Sea will provide new transoceanic flight alternate Airport select more economical and flexible route selection. 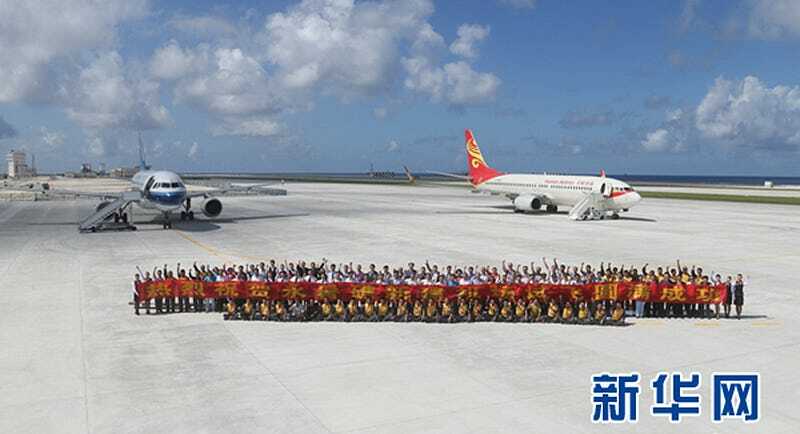 Earlier, on Yongshu Reef new airports were checking flight. Almost laughably there is no mention of military uses for Fiery Cross Reef and its 10,000 foot runway, or its dredges lagoon, and the use of chartered airliners for this initial test is just an extension of China’s total omission of Chinese military involvement in the outpost. It is obvious that this man-made island turned air base, along with other smaller ones being developed from reefs around the South China sea, are part of a much grander plan that aims to give China military dominance of the South China Sea. This includes reigning over its energy and fishing resources, as well as controlling its use as one of the world’s most critical shipping arteries. The question is when will the military hardware begin to show up? Now that the runway is operational, cargo flights can begin that will greatly enhance the speed at which the island becomes a fully operational military base. Where it goes from there, nobody is sure.